I love public engagement. Broadly defined as "engaging the public with research" (as the RCUK puts it), public engagement has been pretty extensively embraced by universities as a way of highlighting the relevance, importance, and impact of academic research beyond the university. In other words, it's a great way to show that the research we're doing as academics can make the world a better and richer place. While we might be the experts in our own research areas, talking to non-academics - professionals, local communities, governments, charities, and multinational organisations - about our research can be incredibly rewarding (and challenging). This summer, I dived into public engagement by getting involved with the Cabaret of Dangerous Ideas. The Cabaret (or CODI for short) is organised by Beltane and is basically an opportunity for academics to present a 'dangerous idea' from their research (e.g. exercise is bad for you; we should get rid of zoos) and discuss it with a non-academic audience while standing on a small wooden stage in a yurt at the largest arts festival in the world. Piece of cake. I've previously written a bit about the content of my show (that we should take romance novels more seriously) and if you're more of an audiophile you can listen to a slightly clumsy radio interview where I talk about the show and my research. What I want to talk about in this post is more generally about my experiences of doing public engagement in case it's of use to any other academics who might be interested in sharing their research more widely. I'm certainly no expert in public engagement, but I've definitely learned some things this summer. So, in no particular order, here are five things I learned doing an Edinburgh Festival Fringe show. 1. Talking to the public is scary (the first time). I don't mean talking to people at the next table in the pub, or chatting to the lady on the bus. Talking one-on-one to people in non-work environment is easy. But when you're up there on that stage, with 40-odd people staring up at you, and they're expecting you to be both clever and funny (it is the Fringe, after all) it can be quite intimidating. I'm not scared of public speaking. I remember being nervous before my first seminar as a postgraduate tutor, and I was slightly intimidated when giving my first lecture to 200 students in the week of my job, but I've taught for so long now, that I've forgotten what it's like to have your stomach in knots, your thoughts scattered, and your hands shake visibly. Doing a Fringe show reminded me of all of that. I felt that I needed to apologise to anyone I spoke to in the hour before the show started because I'm not sure I was in any way coherent. My stomach was tied in knots and my hands were shaking so much I was sure people could see it on the stage. But, after the first ten minutes or so, as people started to laugh and to contribute thoughts and questions, it stopped being so scary. About half an hour in, it even started being fun. And the minute it finished, I wanted to do it again. I suppose anything is scary the first time you do it, and sometimes that nervousness is a good thing - it gives you adrenaline that gets you through it. Personally, I'm looking forward to the next time, when I hopefully won't be scared at all. 2. You will get heckled by your dad (if he's anything like mine). I think the scariest thing about talking to a public audience is that you're not sure how they're going to react. When you give a paper at an academic conference, you know roughly what's going to happen. More often than not, three people will give twenty-minute papers, followed by a half-hour Q&A session. Generally, people don't interrupt, they'll ask (hopefully) polite questions at the end and you might exchange email addresses afterwards in case you want to build a new research relationship. There's a code. There are rules. With public engagement, there are no rules. Well, there are rules, but they're different to the rules you get at an academic conference. 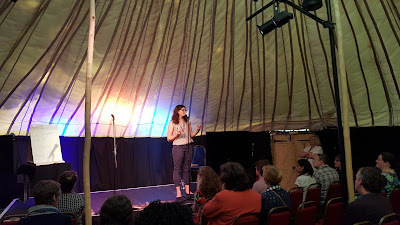 For one, talking at a Fringe show meant that people were much more likely to shout things out in the middle of the show (to be fair, I did encourage them). Begging my friends and family to come also meant that one of those hecklers was my (lightly refreshed) father. But actually, I found the more informal atmosphere energising. Like a teaching session where students are really engaged I had to think on my feet, but because the audience contributed so many comments and ideas, it meant that my role was far more facilitatory, rather than managerial. Being able to riff off and refer to content from the audience meant that I had to spend less time talking, there was less attention and pressure on me as the 'sage on the stage' and I enjoyed myself much more. So, I suppose, thanks for the heckling, dad. 3. You won't get asked the questions you expect. When I was a PhD student preparing for my first conference paper, I was advised by a friend to practice for the Q&A session by trying to think of all the possible questions I could be asked. As it happens, this was good advice; as academics, we know what other academics might ask us because they're the kind of questions we would also ask. Members of the public won't ask these kinds of questions. During my show, the suggestions and questions asked were sometimes far more basic than I'd usually be asked and often more unexpected: "is the bible a romance novel"? I realised how much, as academics, we rely on a base level of research knowledge as a shorthand; we don't, for example, ask about the story content in the Canterbury Tales because the assumption is that we already know it. Members of the public don't always have this base knowledge and so you might find yourself answering questions that (to you) seem obvious, but to your audience are not. 4. Public engagement support exists (and it's for people like me too). Before this summer, I was aware that organisations like Beltane existed, that my university had a whole office devoted to helping academics with public engagement, and I knew that colleagues were involved in public engagement activities. I just never really thought that it could be something I could do. Not just because I research books that are either really old (it's hard to do a panel discussion with a medieval romance author) or really uncool (as I said, we really need to take romance novels more seriously). It was also because as a teaching fellow who wasn't being paid to do research, I felt that I fell somewhat outside of the structures. Most funding council or bodies now require some public engagement as part of any research they fund. Equally, the Research Excellence Framework (a roughly five-yearly census of research outputs in all university departments) now also requires universities to submit case studies of public engagement or research impact. So for most academics, public engagement is definitely on the radar. What's more, as a PhD researcher, I had several opportunities to engage wider audiences with my research. I took part in the 3 Minute Thesis competition (where you have 3 minutes and one slide to explain your entire PhD topic to a non-academic audience) and helped to organise events where academics talked to and alongside professionals, artists, and writers. Universities have clearly done a lot to help academic staff and research students to do public engagement. But as an early career researcher who wasn't employed to do research, I found myself somewhat in limbo. Many of the fellowships and pots of money made available to support public engagement are not available for teaching-only staff. In addition, while my department were super supportive, I get the sense that in other places, researchers like me (who are, effectively, independent researchers who happen to work at a university) might miss out on research mentorship and guidance that they might otherwise receive from a line manager. But, things have changed. While there might not be as many opportunities for a non-research staff member, there were still opportunities out there. By going along to some of the public engagement events supported by Beltane and by getting to know some of the staff who work for Beltane (it helps that we share a building), by following their activity on social media, and by signing up for their mailing lists I realised that there are opportunities for me to get involved in events where I can talk about my research and to get support for it. It was just a question of asking. At first it was just the one Fringe show. But then there was the associated Tweeting and blogging, the radio interview, the social media connections (this has been great for my Twitter follower numbers, guys). I've since been invited to speak on a panel at the Sheffield Festival of the Mind. I get the feeling that once you've started getting into public engagement, people start to recognise you as someone who can communicate their research well to non-academic audiences. You begin to be publicly associated with particular research areas. You get invited to more events and activities and, through networking and working with other publicly engagement academics, you learn how to be better at public engagement yourself. So there you have it - my assorted advice and reflection on what I'm (privately) calling my first 'summer of public engagement'. I'm sure it won't be the last. National Co-ordinating Centre for Public Engagement (NCCPE) - funded by the research councils and the Wellcome Trust there's a helpful and accessible guide to getting started in the 'Do It' section of their website.